VIRAL: Steve Harvey Apologized to all Filipinos Using Bad Words! 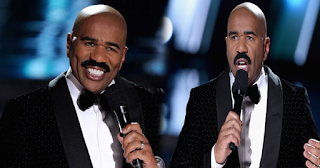 Steve Harvey became the hottest topic of the town after he hosted the legendary pageant Miss Universe, he accidentally mixed up the 1st runner up with the Miss Universe placer which is supposed to be the Miss Philippines not Miss Colombia. During that moment, after a minute of announcing that Miss Colombia was the winner, he immediately came to stage and withdraw what he have told, he apologized sincerely to public because of what he have done especially to the side of Miss Philippines that should be the Miss Universe 2015. Recently, he posted again to his Twitter account apologizing to all the Filipinos, he asked his Filipino friend to help him translate the word "sorry" in Filipino language, but unfortunately, his friend taught him the other way around which is the faulty word to all Filipinos. Some people take it as a positive one, they claim that its the same way many Filipinos say sorry, with a bit of confusion or fun to make the other side laugh, they consider it as the ice breaker. But there are still others who don't accept it the way it should be.